What is it that causes one person to be attracted to another person? If you look back and try to pinpoint the moment you fell in love with your significant other, can you? And, if you had not been in that place at that time, would you have missed the opportunity entirely? So we have this girl, Hadley Sullivan. Her parents are divorced, and her father, who she hasn’t been very communicative with lately, is getting remarried. Hadley hasn’t met this woman yet, the woman that her father fell in love with while on a fellowship in England at Oxford. Of all people, it is her mother that pushes Hadley to go, not wanting Hadley to later regret missing it. Hadley is running late – she’ll never make her flight. As she reaches the gate, the doors are closed and she’s forced to take a later flight, one whose arrival time is dangerously close to the start of the wedding. This is the beginning of a series of normal, everyday occurrences that bring Hadley to meet Oliver, a British Yale student, who is also returning home to attend a function, suit bag in hand. If just one thing went differently, would the result have been completely different? Is there such a thing as fate, something that guides us to the correct outcome, or would deviating from even a single event would have changed everything? Is life just a fluke, a happy accident? Or is it preordained? Hadley and Oliver have seats together on the plane, and as they get to know each other, Hadley wonders if love at first sight is possible. Is that what happened to her father and Charlotte? Are her parents happier now than when they were together? Is she harboring a lot of anger for someone she loves because her expectations don’t match the outcome she expected – even though it may be better for everyone? But once she and Oliver have gone their separate ways, she realizes that the reason she has been able to deal with the wedding day at all is because of Oliver. Then she discovers why he was hesitant to reveal himself to her completely. Will fate step in and guide them to the right conclusion? Or will Hadley take fate into her own hands? If these two characters had met under different circumstances, say at a party or at school, they might not have ever been inclined to say hello, much less get to know each other on this level. Hours spent together in small, confined spaces are always highly conducive to revealing conversations and deep attachments. In any other arena it would have been odd to get this close in such a short period of time. Then there’s that stranger aspect – it’s always easy to be honest with someone if you think you will never see them again. But the rub is always this: what if you want to see them again? 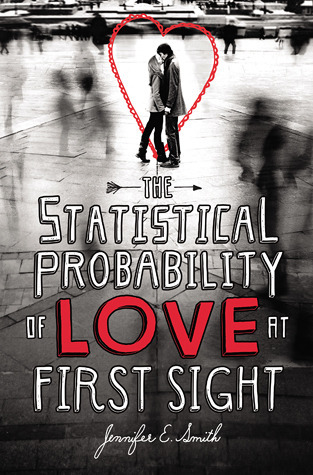 The Statistical Porbability of Love at First Sight by Jennifer E. Smith was published January 2, 2012 by Poppy/Little Brown. Ink and Page purchased this book, so no one had a choice about whether it was reviewed. I’m not a big fan of contemporaries, but I do like the premise of this one. It makes you think and I am interested to know how things play out for the characters. I like contemporaries, but I like just about every flavor of YA/NA. It’s a little deeper than being just a confection, too. This one is already on my wishlist. I can’t wait to get to it someday. It sounds fun and thought provoking not always a combination you find together. You’ll have to tell me how you like it. I saw a comment on Amazon where the reviewer took offense at how the child of divorced parents was handled…too much.